WITHOUT GOD were formed in Korolev, the Moscow region in early 2008 by Anton (guitar, vocal) and Olga (guitar). Ivan (drums) and Victor (bass) joined, and, with this line-up, the band made two demo-recordings entitled "Grief" and "Believe and Forgive" in 2009. WITHOUT GOD tend to play a raw blend of traditional doom and sludge, and are known as one of the most interesting live act of the Moscow metal underground. Follow the band on Facebook. 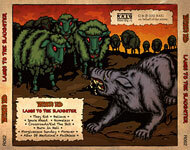 "Able to write fluent songs, literally oozing groove, progressing mid-tempo, able to infuse an almost energic vibe all along their fat, beardy, smoky tunes, these rookies show a astonishing talent in regurgitating all the genre’s gimmicks in a coherent and exciting way... Those Russians have produced a convincing Stoner Doom album with 'Lambs to the Slaughter' and once again, whatever the genre, and however inspired the songwriting can be (and here, it’s really above average), you never fault those eastern guys on their talent as musicians; it’s not that complex, but it’s precise, in tune, and inventive. For a first full-length, I don’t ask for more!" – by Bertrand Marchal of Doom-metal.com (Belgium) (April 2011). "Lambs to the Slaughter is more than just a convincing stoner-doom album, it is a quality dose of great song-writing within the realms of classic heavy-rock. It is infectious from start to finish and has more than a dozen or so riffs that knock you to the floor. The quality of song-writing is well above-average and no offense to all the other Russian bands but this album should be your benchmark especially if the stoner-doom genre is your chosen style. (Score: 9/10)" – by Ed Barnard of Doommantia (USA) (April 2011). "If you took the plodding, dirge like rhythms and unbridled heaviness of a band like Crowbar and mixed that with heaping doses of massive sounding, Sabbath infused riffs, that would probably give you the best idea of what these guys bring to the table. The main and certainly the most important thing that sets these promising musicians apart from the rest of the pack, is that they understand the importance of writing good quality songs, which is a vital ingredient I find that is often missing from a lot of bands operating in this genre of music... After listening to Lambs To The Slaughter you get the feeling that Without God is standing on the edge of greatness and believe me if they put together another opus that is as solid as this one is from beginning to end, by the time the dust has settled, they will have effectively crossed over to the other side. (Score: 4.5/5)" – by Ryan Sparks of Sea Of Tranquility (USA) (May 2011). The album was reviewed at: Rate Your Music (USA), Encyclopaedia Metallum: The Metal Archives (Canada), Metal Library (Russia), CVLT Nation (USA), The Obelisk (USA), Cosmic Lava (Germany), Chief Ryan's Brutal Beer And Metal (USA), Metal Library's interview with Without God (Russia), Doomsmoker (Poland), Doom Metal Front's interview with Without God (Germany), Black Insect Laughter (UK), Something Sweet To Throw Away (Australia), Encyclopaedia Metallum - The Metal Archives (Canada). 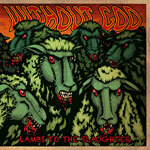 This is an official debut EP-release by WITHOUT GOD. Recorded and mixed by Anton at the band's rehearsal space in spring-summer 2010. Includes four new tracks and re-worked version of "Forgiveness Sunday". The Without God EP is also available as a pro-duplicated CD-R. Limited to 100 copies and packaged in a rough oversized thick pasteboard case with silkscreened, handassembled printing. Comes with 1" color button featuring artwork from the album. (5 tracks - 29 min.). Read about: Metal Library (Russia), Metal Library's interview with Without God (Russia), Doommantia (USA), DarkSide (Russia), Far From Moscow (USA), It Sounds Awesome! (Russia).